DO YOU WANT TO BECOME AN ENGLISH TEACHER IN ONE MONTH? 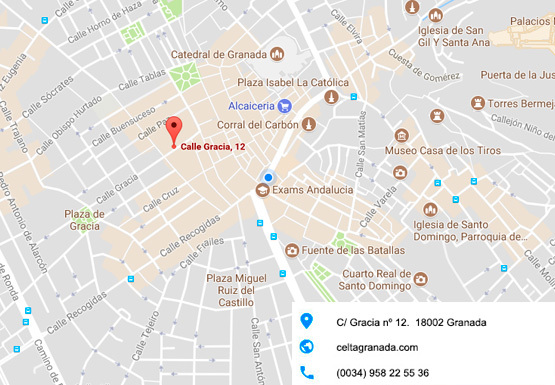 Welcome to CELTA Granada – the only Cambridge accredited TEFL course in Granada	We are a dynamic teacher training centre in the heart of Granada. Our courses take place at the Institute of Modern Languages (IML), a traditional, friendly, well established language school which has taught countless students for well over half a century. Los sistemas de enseñanza que se utilizan se ajustan a los más altos niveles pedagógicos de enseñanza del inglés en el mundo. La plantilla docente es escogida meticulosamente y está sujeta a controles de calidad tanto en metodología lingüística como en eficacia pedagógica. Los resultados obtenidos por nuestros alumnos en exámenes internacionales se elevan muy por encima de la media nacional. This is a one month, face-to-face, intensive course which equips you with basic teaching skills. In the mornings you practise teaching ´real` students and in the afternoons you learn about teaching techniques and methodology. It´s ideal for people with little or no experience of teaching and open to both native and non-native speakers. They are both very similar. 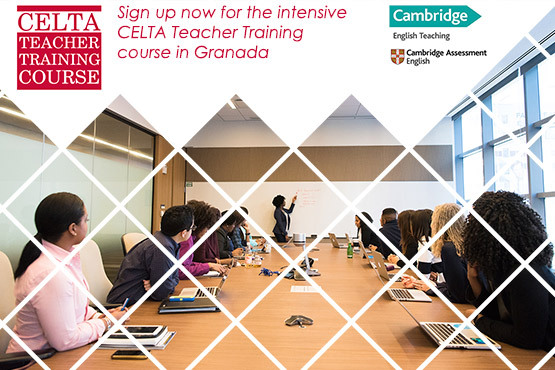 The principal difference is that the CELTA is accredited by the University of Cambridge and is the best known English teaching qualification available at certificate level. Every CELTA course is moderated by the university and centres offering this course have to meet rigorous criteria regarding the competence of the trainers, training centre facilities and administrative procedures. The Trinity CertTESOL is accredited by Trinity College London and courses must also meet very high standards as stipulated by the college. Everyone says the CELTA is really hard work, is that true? The course is intensive and demanding. There is a great deal to learn as well as completing assignments, planning and preparing lessons, and teaching. The course takes 100% commitment and there is a lot of work to do in the evenings and at weekends. Our skilled and dedicated training team will do their utmost to ensure that every trainee receives all the help they need right throughout the course. Do I have to have taught before coming on the course? The CELTA course is designed for people with little or no experience. It is an introductory course and gives the basic principles in how to teach English. Can I do the course over many months? Right now we do not have a part-time option. Nevertheless, it is something that we are considering for the future and in 2018 we will be looking into the possibility of offering a less intensive course structure. Do I need to be a native speaker to do the course? In fact from our experience we have found that often the best teachers, especially of grammar, are not native speakers. Nowadays most English communication is non-native speakers to non-native speakers and often learners feel better able to relate to non-native teachers. However, through the application procedure, candidates will be expected to demonstrate a very high level of written and spoken English. We welcome applications for people of 20 and over. It is truly an enriching experience to have a variety of age groups on the course. So, if you have just retired or are even more mature in years and want a new challenge then send us an application! We will also consider applications for people who are 18 or 19, at the discretion of the centre. Is it necessary to have a degree? It is not essential to have a degree. However, the candidate needs to have a sufficient level of education that would allow them onto a higher education course. During the application procedure we will be able to assess the suitability of the candidate for the course and advise them accordingly. Is it possible to teach children with the CELTA? The CELTA traditionally stands for the Certificate in Language Teaching to Adults. However, nowadays schools accept this qualification for learners of all ages. If you are interested in teaching children there are supplementary courses that you can do which focus on teaching young learners. Trainees are expected to attend every class and complete all the units on the course. If a trainee is unable to complete the whole course and submit all the assignments then a certificate cannot be issued. There are of course exceptional circumstances, through illness or family issues, where completion of the course may not be possible. In these cases an appropriate recovery programme will be drawn up between the training team and the candidate. On our website we recommend a selection of material which will not only help with the pre-interview and pre-course tasks but also with the course as a whole. It is not necessary to buy all the books but we do suggest getting hold of a selection just to familiarize yourself with the material you are likely to encounter on the course. Also, get plenty of sleep! The course requires a lot of time and energy and we recommend you come on the course refreshed and ready to work hard! Can I still do the course if I am already an experienced teacher? We welcome applications from teachers who have been teaching for a while and who want to get an accredited qualification, keep up to date with current methodology or simply refresh their teaching skills. You would need to follow exactly the same application procedure as other people but we would certainly take your experience into account. Is it likely that I will get a job after the course? Copyright 2017 Institute of Modern Languages, IML Granada All Rights Reserved.